Each afternoon, I treat myself to a cup of hot tea. It’s part ritual, it’s part luxury, it’s part 10 minute spa-in-a-cup. I love teas of all kinds, but an Earl Grey, with all its aromatic nuances, definitely evokes a sense of calm and sophistication unlike any other tea. Drinking tea is one thing, but cooking with tea is something even more special! 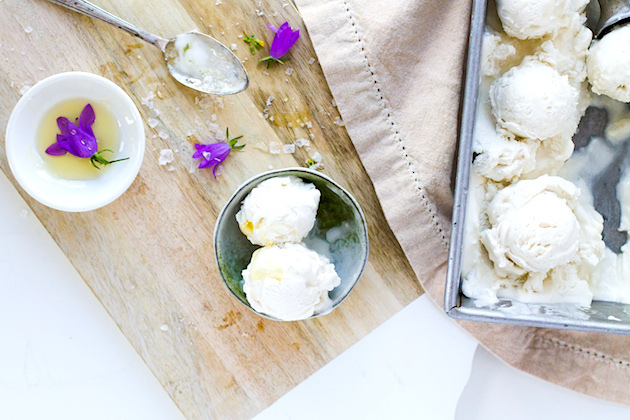 I’ll never forget the first time I made a tea infused ice cream from scratch – I will forever tuck that away in my list of delicious moments. So what could make a tea ice cream even better? 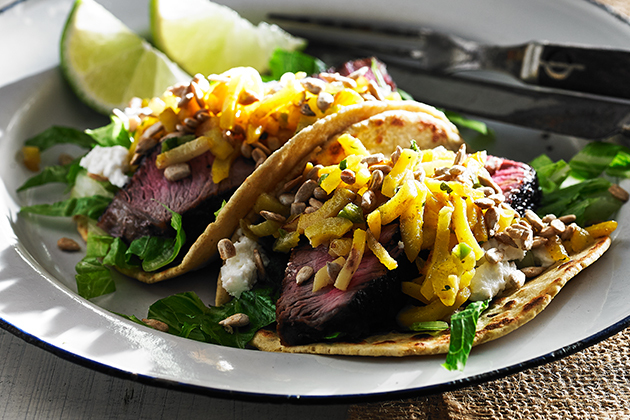 Pairing it with tea poached pears! Earl Grey tea poached pears with dried cherries lends its floral notes to a beautiful syrup, giving the pears not only a wonderful flavor, but a beautiful subtle hue that looks so elegant, it would make anyone think you’ve worked so hard to create such a stunning dessert. But the truth is, poached pears is actually quite simple, and something you can even prepare in advance, making it dinner party material. Start by making the custard for the ice cream. In a medium sauce pan, bring heavy cream, milk, sugar, tea and vanilla to a bubble, and let the tea infuse the sweet cream. It will turn into a velvety shade of mocha, speckled with vanilla bean. Use your KitchenAid® Professional 600 Series Stand Mixer to whisk egg yolks until they are a light shade of butter and thick. As you join the egg yolks to the cream and let it simmer, the custard will thicken until it can coat the back of a wooden spoon. At this point, you’ll just want to drink up the custard, but be patient, and let it sit in an ice bath, letting the custard cool completely. 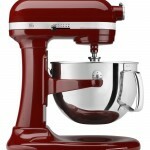 At this point you can churn your custard using the KitchenAid® Ice Cream Maker Attachment. It only takes about 20 minutes or so until it is transformed into perfectly decadent soft serve Earl Grey Ice Cream. 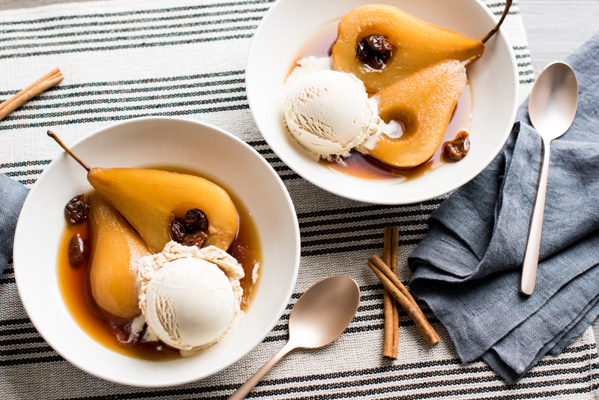 While the ice cream chills in the freezer, make the Tea Poached Pears. 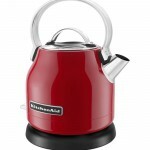 Using the KitchenAid® Electric Kettle, bring the water to a quick boil. Pour this into a sauce pan with sugar, tea, cinnamon sticks, and dried cherries. Place your peeled and cored pears into the amber liquid and let it simmer over medium heat until the pears are just tender. Once the pears are done, and you’ve set them aside to rest, let the liquid continue to bubble until it reduces into a richer syrup. Let the pears cool in the syrup. When dessert beckons, place a pear half into a shallow bowl with the tea infused syrup and serve with a scoop of the ice cream! In a medium sauce pan, combine the heavy cream, whole milk, 1/3 cup sugar, tea, vanilla beans and pod, and salt, and bring to a gentle simmer over medium heat. Use a wooden spoon to stir, dissolving the sugar, and bring the cream mixture to about 175 degrees (about 8 minutes). Turn off the heat, cover the pan, and allow the tea infused cream steep for 15 minutes. Meanwhile, whisk the egg yolks in a the bowl of a KitchenAid® Professional 600 Series Stand Mixer furnished with the whisk attachment, and slowly add the sugar, whisking until the eggs are light in color and thick. When the cream finishes steeping, ladle 1 cup of the hot cream in a drizzle into the eggs while whisking to temper. Pour the egg mixture back into the saucepan, and gently cook over medium low heat, stirring constantly with a wooden spoon for about 5-8 minutes. You will know the custard is ready when you are able to coat the back of your wooden spoon and run your finger down, leaving a line. Prepare an ice bath. Strain the mixture into the prepared bowl of the ice bath. Let the ice cream custard cool for 1 hour in the ice bath, stirring periodically. The ice cream may then be churned immediately or, if you like, the following day (keep the mixture chilled in the refrigerator until then). 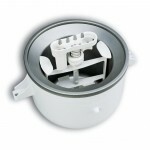 Pour the custard into the chilled bowl of the KitchenAid® Ice Cream Maker Attachment and churn for about 30 minutes. It may be served immediately or stored in an airtight container in the freezer. Bring 4 cups water to a boil in the KitchenAid® Electric Kettle. As the water comes to a boil, combine the sugar, tea, cinnamon and dried cherries in a medium saucepan. Add the boiling water, and stir to dissolve the sugar. Place the pears into the liquid, then heat over medium heat, and simmer the pears for about 15-20 minutes or until tender. If you wish, place a plate over the pears to keep them submerged in the tea as it simmers. When the pears are tender, remove and cool the pears. Bring the syrup to to a boil and let it reduce by half. Strain the syrup, and let it cool before chilling in the refrigerator. The pears and syrup can be prepared in advance; chill in a tightly sealed container in the refrigerator. To serve, place a pear half in a shallow bowl and pour some of the syrup over the top. Serve with a scoop of Earl Grey ice cream. Thank you so much, dear Alice! 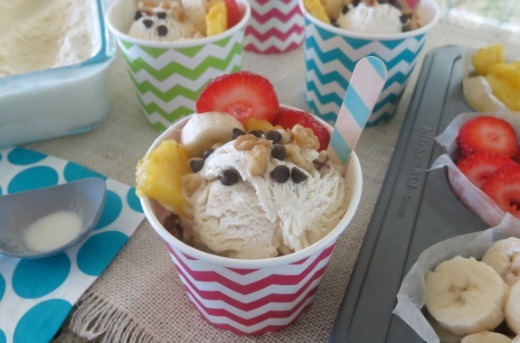 A recipe worthy of christening our new ice cream maker with. Thanks for sharing! Thank you, Mary! I hope you enjoy it! So, so good. Everything went perfectly! Yum.